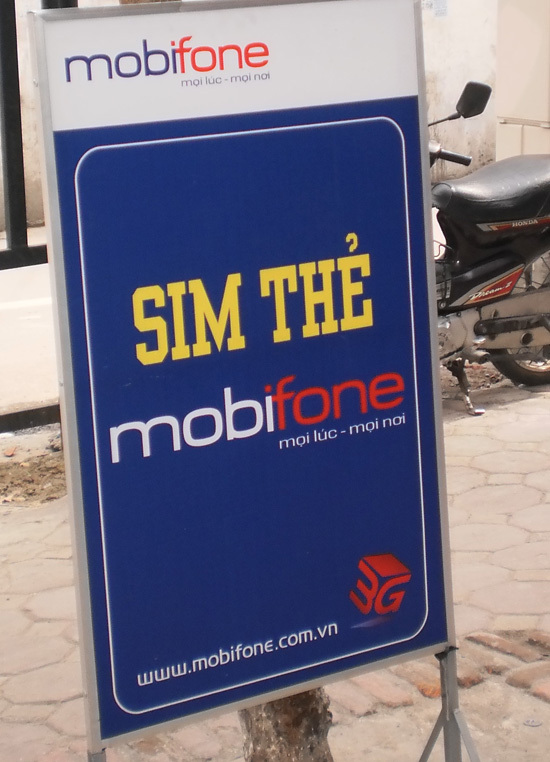 It’s really cheap and easy to get a Vietnamese SIM card when you get to Hanoi, and if you’re in the country for a while it’s probably worthwhile, particularly if you plan to book hotels in advance. I was fortunate enough to inherit a Mobifone card from some girls we were travelling with in 2009 and, surprisingly, it still worked when we got back here in 2010. My boyfriend and various visitors have all bought cards here themselves, however, with no problems. So, you need to look out for stalls advertising ‘SIM The’ — in my experience there’s never one there when you want one i.e. when you run out of credit, but keep your eyes peeled and you’ll spot them around. There’s a small stall on Hang Bac in the centre of Old Quarter anyway, so try there if you’re having trouble. They speak some English and the last card I bought there had a sticker attached with details about the credit on the card e.g. how many international minutes it included. Even if you don’t go there, don’t worry about the language barrier, particularly if you’re in a touristy area, as it should be easy enough to indicate what you’re after. To start with, they’ll probably just sell cards and top-ups anyway, and besides they’ll be in a glass case, so you can just point and wave your phone about. 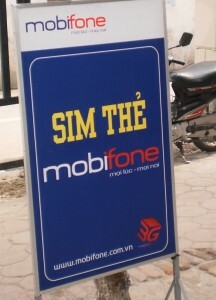 If you’re just on holiday then it doesn’t really matter what network you’re on but each time we’ve bought a new SIM we’ve been offered Vinaphone so chances are that’s what you’ll get. The card will probably cost 100,000VND (about $5) and that should have a little bit of credit on it but if you expect to use it a lot you might want to get one with more credit on it, or buy a top-up there and then. You can check the credit by keying *101# and OK / Call so if they’re pushing you to buy extra credit you might want to do this first. Top-ups are available in a range of denominations and instructions are on the back. A couple of final things worth noting. Firstly, you won’t be able to use the card outside of the country and secondly, check you can use your phone with other SIM cards. If you’re on a pay monthly deal back home you might find that your phone is locked, meaning you can’t put another SIM card in. Check with your provider well before you leave home or be prepared to buy a cheap phone when you get here.